Biodiesel is an alternative fuel for diesel engines. Patent invention production of biodiesel production is focusing on chemically processing and recovery technology from waste vegetal oil or animal oil or fat in urban catering pigwash. This biodiesel technology provides efficient solution for treatment of urban waste oil and fats, reducing environmental pollution, and improving economical and social profit. ● Urban catering pigwash screening. Screener will screen out impurities from urban catering pigwash at speed of 15T/h, and separation system will separate different impurities at speed of 15T/H. ● Solid-liquid separation. Crush the mixture of oil and water at speed of 15T/H into 200-300 mesh powder, wash with 85-95 ‘C hot water, separate liquid and solid by centrifugation. ● Water and oil seperation. The liquid is sent to centrifugation after solid-liquid separation. Oil and water are separated at speed of 5T/H. The separated waste oil can be used to process biodiesel, and water can be recycled for use. ● Solid treatment after separation. 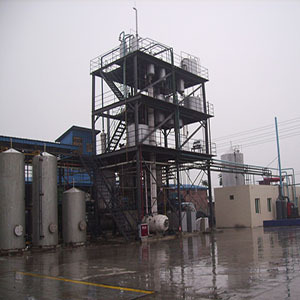 The solid part forms into meal, which can be used as feed material after being crushed into 300-400 mesh particles. This treatment of urban catering pigwash realizes industrialized production of biodiesel and feed materials.